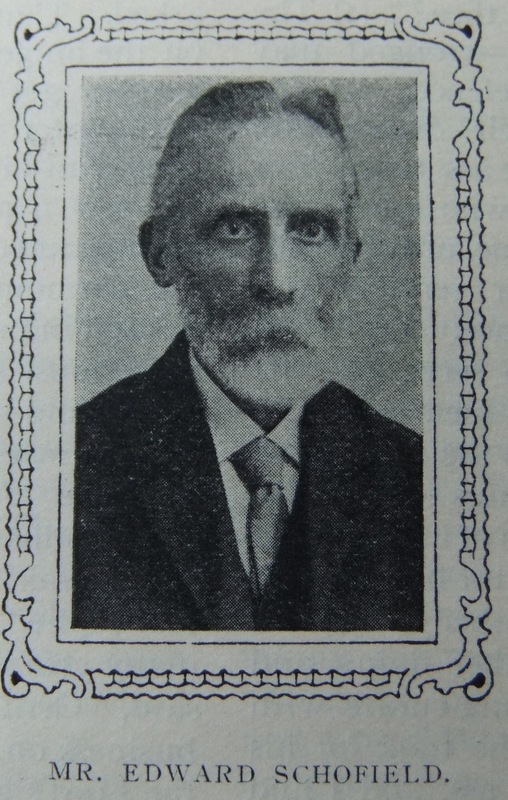 Edward Schofield was born at Heckmondwike on December 18th, 1846. About forty years ago he entered business in Batley, in which capacity not a little success has attested him. This prosperity, however, has been no mere “stroke of luck,” but the result of close application and careful management on the part of both his wife and himself. In August, 1887, so official records show, during the ministerial terms of the Revs. E. Dalton and M. Knowlson in the Heckmondwike Circuit (of which Batley was then part), Bro. E. Schofield was “recommended for the office of Society Steward. Evidently the appointment was duly made at the ensuing September Quarterly meeting. It is noteworthy that this promotion took place only a few months after our esteemed friend became a primitive Methodist. Previously the Salvation Army was favoured with his adherence and active support, and, earlier still, the Wesleyans. That these transfers do not indicate constitutional fickleness is sufficiently proved by his business stability and the lengthened term of office above mentioned. As steward, Bro. Schofield most diligently attends to his duties. During the past twenty-two years he has probably not been absent from six quarterly meetings. No one could be more careful in the keeping of accounts and the supplying of pulpit notices. Because so natural, his greeting of the preacher in the vestry is as regular as it is cordial. His geniality is further attested by the fact that he recollects no personal grievance associated with his official experience. Ministers have ever enjoyed his friendship, and in his home much hospitality, as also have ministers’ wives. Census returns and other records suggest that Edward was born in January 1844 at Heckmondwike, to parents George, an ironmonger, and Elizabeth. He was baptised in the Wesleyan Chapel on 5 May 1844. Edward married Mary Lakin (1847-1875) on 12 May 1868 at St Peter, Birstall, Yorkshire. Census returns identify one child. Edward married Mary Jane Nutter (1849-1933) in early 1876 in the Dewsbury Registration District, Yorkshire. Census returns identify one child. Edward died on 26 July 1923 at Batley, Yorkshire.